Another year, another Woody Allen movie. Allen continues his recent prolific streak with a return to Europe after a brief jaunt back to the States last year with the Oscar-winning (and box office hit – not a given by any means with a Woody Allen film), Blue Jasmine. 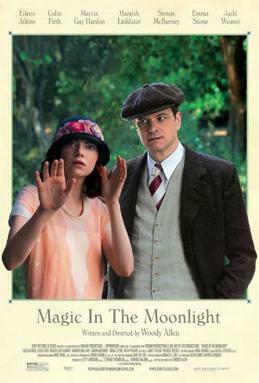 Set on the French Riviera, Magic in the Moonlight follows Colin Firth as magician Stanley Crawford as he attempts to debunk Emma Stone’s Sophie, a self-prescribed clairvoyant who has seemingly wormed her way into a wealthy family by using her ‘skills’ to contact the matriarch’s deceased husband while seducing her bachelor son along the way. Ever since Allen returned to form with Vicky Cristina Barcelona in 2008, actors have been queuing up to appear in his movies and this film also features a sterling cast. Firth and Stone are backed by excellent roles for Simon McBurney (excellent in the underrated Rev and used disappointedly sparingly as an exposition character here), Hamish Linklater and Eileen Atkins – all of whom are a joy on screen and whose presence is missed when we’re alone with Stone and Firth. That’s not to say they’re a bad watch – Firth plays the pompous, upper class Englishman like only he can (sorry, Hugh) and Stone is as charming as ever in a role that allows her to mix her dramatic and comedic abilities. The inevitable romance that ensues between them is predictable, as well as a little unsettling (Firth is 30 years Stone’s senior) and I found myself frustrated with the ending after being teased 10 minutes before the credits with what would have been a much more satisfying finish. This film is undeniably an Allen movie, with some luxurious shots of the French coastline and grand chateaus, with an expertly shot party scene alerting the viewer to how The Great Gatsby might have been made through Allen’s lens. The dialogue is excellent, as expected from an Allen film, and I enjoyed this film much more than I expected. The film has its flaws, with a wafer thin plot and red herrings that come at a rapid pace. The twist is quite simple to solve, the ending is preposterous and I did begin to find Firth’s character annoying as the film progressed (though I suspect this may have been intentional). A quick glimpse at Allen’s IMDb page shows that he is already in production on his next film, starring Joaquin Phoenix, which strikes me as an intriguing pairing, and something to look forward to next year. At 78, Allen shows no signs of slowing down and if he continues making charming movies like Magic in the Moonlight, long may it continue.